When you tell the other person what your goal (or your intention) is for an interaction, they are more likely to listen to you, rather than prepare to defend themselves or get annoyed. If you're talking about an important subject, or if you know you might get a mixed response, or if the other person might jump to a negative conclusion, then definitely use this tip at work or at home. It's a good one! Stating your intentions may sound fancy, but in reality, the only thing that you are doing is letting the other person know the purpose for the interaction. For example, perhaps you want to get along better, you don't want to start an argument, or maybe you want to be closer to them. Whatever your intention or desire is for that one interaction, you tell them at the beginning of the conversation. 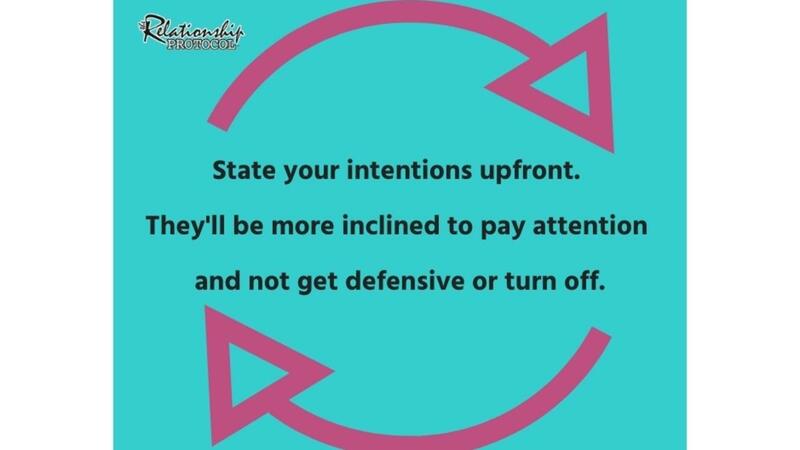 When you state intentions from the start, this stops their mind from wondering WHY you are talking to them about that subject. Most of the time, it'll be a relief for them to know the reason for having the conversation. So, give them the "why" from the get-go. Let their mind relax and connect with the full content of your message and your true intentions.